Looking for a Motorized Awnings! We have retractable awnings to fit just about any budget and application for homes and businesses. All of our retractable awnings are imported from Italy and made locally in New York. Cassetted Retractable Awnings have an integrated hood and tray that wraps from the top around the back and bottom of the awning. 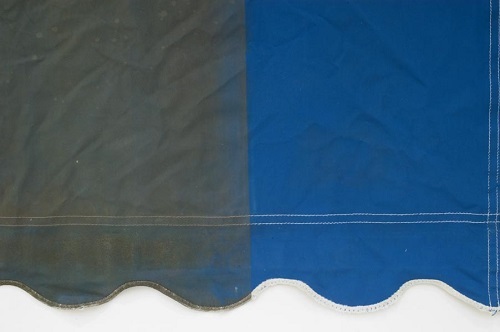 Consider this technology as an automatic fabric protection system. Semi-cassette and full-cassette style retractable awnings offer far superior weather protection for the fabric, motor and operating mechanisms versus optional hood style awnings, and significantly extend the anticipated lifespan of your awning's fabric cover. This popular design is simply the best option when mounting your retractable awning on the roof, under a soffit or on a wall. Backed by a limited lifetime warranty, the Bella Plus full cassette is one of the most technologically advanced awnings in the industry. A shading system that is self-supporting and can provide shade when you want it, but retracts when shade is not required. Sometimes called a lateral arm awning, it relies on spring loaded arms to extend the awning and apply tension to keep the awning fabric taut when open. What supports a lateral arm awning if it does not have supporting poles? A good quality retractable awning should not need support poles. Quality deck or patio awnings rely on two things: 1) a secure mounting to your structure in conjunction and 2) a strong framework to support its own weight. 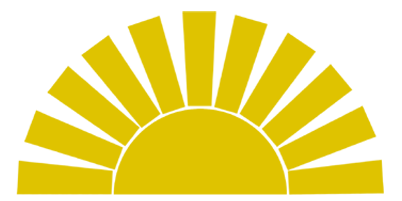 The arm tension is created from springs inside the arms. Large radius elbows will keep the fabric tight by applying outward force. What happens when I’m not using my awning? A retractable awning is self-storing. It is retracted when not in use. In the retracted position, it is protected from damage that adverse weather can cause. 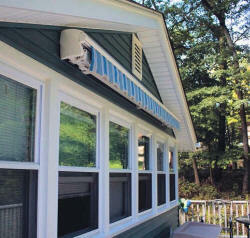 How are retractable deck and patio awnings installed ? This is a job best left to professional awning installers. A qualified installer locates the structural framework of the home and pre-drills installation bracket holes through any siding to tie in directly to either wall studs or headers. On roof mount applications, the installers tie into the rafters. They pre-drill to avoid cracking, and add silicone caulk to the pre-drilled holes, hardware and brackets for leak prevention. Most mounting applications utilize 3/8" lag bolts in varying lengths, depending on mounting surface . If your older awning frame is in good working condition but you are in need of just the fabric cover, you are in luck! Did you know that awnings with acrylic fabric like Sunbrella can be "recovered"? Birds destroyed your awning fabric? Changed the color of your siding? We can replace just the fabric top cover of almost any retractable awning out there, from virtually all major manufacturers, even if we did not install your awning. 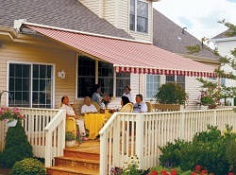 Sunbrella awnings are made from synthetic materials. 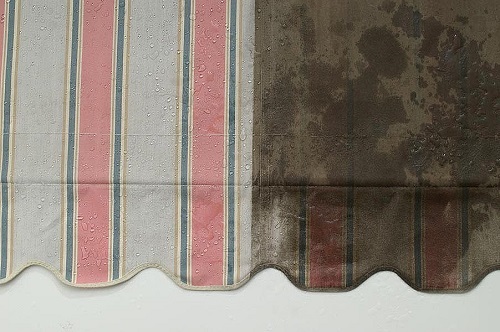 But over time if not cleaned regularly, environmental build-up such as pollen and dirt on your awning fabric can itself accumulate mold and mildew and soil. Most awning fabrics have a longer life expectancy and look better when cleaned occasionally. Let us clean your awning fabric and restore its beauty and water repellency. The Bella Plus is a "full cassette" hood style. The arms, fabric and all operating mechanisms are hidden from view and the elements when retracted. 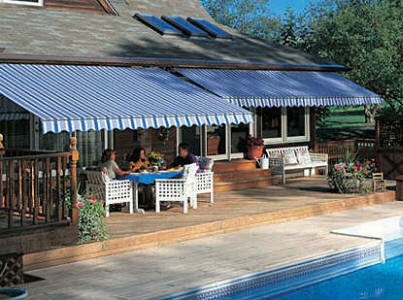 It is one of the most technologically advanced awnings in the industry! Our most popular model! The Elite Plus is packed with options that allow it to fit into the most typical applications. The Elite is the best value. The Triumph is build purely for large projections. Engineered with forged arm componants, this awning is designed for larger decks and patios. Lacking the refinements and technologies of the rest of the line, the Regal is a retractable awning designed for the budget-minded. Retractable Pergolas? Yes! Shades for the tops of pergolas? Yes!